Be the head chimp at Funky Monkey Records. Click here to play! You need to sign up new acts in order to keep your record studio afloat. Check out the bongo playing Banji or the Superfly Sava who rocks out on the keyboards. It's up to you to sign some new acts and start raking in the cash. The Funky Money is going to help you spot your talent. He only appears on selected reels but he will double the prize when he appears in any winning combination. If you're lucky enough to spin five Superfly Savas, you will be paid out 2000 times your original line wager. Five Bongo Banjis will pay out 1500 times your wager. There are also several other symbols that will help you in bringing in the cash. Five jeeps win 1000 times your wager. Five gold records pay the same. 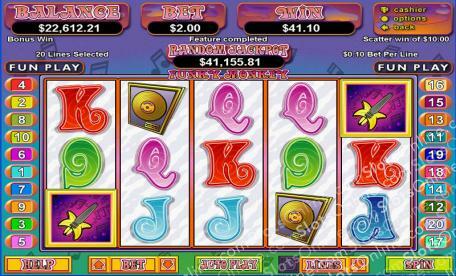 The Funky and Monkey chips trigger the bonus game that will see you selecting your favorite act to play in front of an audience for free games. Jump into the role of producer at Funky Monkey Records and see yourself rolling in the dough with all of your gold records. The banana guitar acts as a scatter. One to five of these icons anywhere on your board will pay 100 times your total bet. Funky Monkey wears a purple feather boa, a red hat and star sunglasses. He's the ultimate performer when it comes to funk, and he also acts as a substitute. He only appears on reels 1, 3, and 5 and will substitute for all other symbols excelt the 'Funky' and 'Monkey' coins and the banana guitar. The bonus game is triggered when the 'Funky' coin appears on reel 1 and the 'Monkey' coin appears on reel 5. It's a pick a box stlye game that allows you to pick your favorite performer to play for free games.